This recipe is quick and easy to prepare for a weekend morning treat or teatime snack. If you are avoiding dairy, these muffins allow you to enjoy chocolate without the lactose. Be sure that you purchase dairy-free dark chocolate chips. Make sure to read all nutritional labels carefully to make sure that there are no hidden dairy-derived ingredients. A typical muffin recipe includes milk. In this recipe, soy milk is substituted. You can use a different type of milk substitute if you prefer. Almond milk would do well. Just be sure to look for unflavored and unsweetened soy milk or almond milk. You can keep a mixture of the dry ingredients in an airtight container in the pantry for quick breakfast and snack solutions. Besides using it for chocolate chip muffins, you can experiment with other flavors. Think of adding nuts, raisins, dates, dried cherries, or dried cranberries. However, if you are using fresh fruit (such as blueberries), you would probably have to make adjustments due to the moisture in the fruit. This recipe is suitable for dairy-free, lactose-free, and vegetarian diets. It contains an egg white and therefore is not a vegan recipe. Preheat the oven to 375 F. Line a 12-cup muffin pan with muffin cup liners. In a medium mixing bowl, combine the white flour, oat flour, sugar, baking powder, baking soda, cinnamon, and salt. Set aside. In another medium bowl, with an electric hand mixer, combine the soy yogurt, soy milk, egg white, apple cider vinegar, and oil. Add the dry ingredients gradually to the wet ingredients and mix at a low speed until just combined. Fold in the dairy-free chocolate chips. Portion the batter into the prepared muffin cups and sprinkle lightly with sugar. Bake until golden brown, about 25 to 30 minutes. 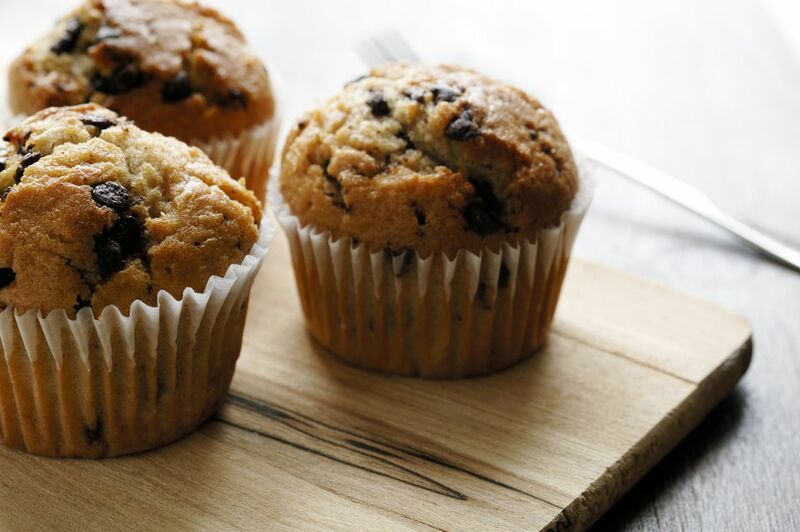 Using paper muffin cup liners allows you to handle the muffins more hygienically, especially if you are serving them at a party or social brunch. As well, you can choose festive designs. While you can simply grease the muffin cups well or use a silicone baking form, it is more foolproof to get the muffins out of the baking pan if you are using paper liners. Muffins will usually be less domed on top if you are using paper liners. This is because the sides set faster without liners and the dough rises up in the center before it sets.